Possibly some of the family members will find this of interest. If I could afford to buy hundreds of copies for the relatives, I would, but I can’t. Blogger is playing its frustrating silly buggers game again with uploading images, so if they don't appear as instructed you won't even be reading this! NEW! 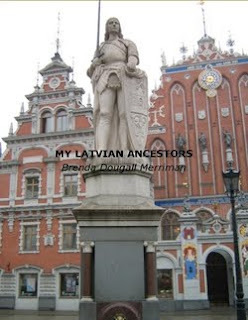 My Latvian Ancestors. (May 2011). 72 pp., illustrated. $22.00. UniBook. Never mind, it's all there inside. With the help of new friends, good researchers, many relatives—who speak and read languages I don't know—and the amazing digitization of Latvian and Estonian historical records, we have reached back about 300 years. The Baltic genes are survivors. I say Baltic, because the Livonian origins of the Jurikas family reach back into the mediaeval mists of what is modern Estonia. "Family memories, overseas researchers, and modern technology enabled a genealogical glimpse into life under Russian Imperial, then Soviet, rule. This book is a tribute to hardship scarcely imaginable from our Canadian distance of place and time. It is also a celebration of nine generations from serfdom to freedom." The compiler’s shortcomings notwithstanding, this type of production has been a satisfying process, all things considered. It is not an e-book; it’s a soft-cover paper copy in living colour. UniBook does a wonderful job reproducing photographs. Family histories that reach the print stage always draw more information. More news is already coming from Riga. That's why I have a BLOG! Without a doubt, to be continued ... If you have questions, you know where to reach me, my full name @gmail.com. 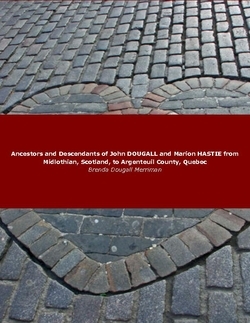 Ancestors and Descendants of John DOUGALL and Marion HASTIE from Midlothian, Scotland to Argenteuil County, Quebec. (January 2011). 59 pp., illustrated. $18.98. This is the one on which said compiler neglected to add a brilliantly chosen cover photo. My bad. Live and learn, I always say. Luckily I learn something new every day. Whether it's good for me or not. So, Blogger people. I keep bumping my head on some invisible ceiling where the learning curves go off my personal graph. This post took about two hours of torture to assemble, not even trusting that the images currently displayed will whimsically disappear as they have from prior posts. I'm tired of looking at Blogger Help and pursuing all that, helpful as some users are. Maybe it's time to change platforms or whatever they're called. My FB colleagues will surely have wisdom and comfort for me. Genealogists who blog are called Geneabloggers (at least the ones who find mutual fellowship among the growing Geneabloggers network, and who try to keep up with following each other; we are nearing the 2,000 mark as Thomas keeps us updated). Many of us (most?) have not met each other in person. Never mind: personality and character come through in the written word. Support, assistance, and comfort are always being offered. Thanks to Greta at http://gretabog.blogspot.com, I believe I've identified an important ancestral portrait that long eluded me. No-one had written on the back of this photograph to identify the man. It was in my “Latvian Collection” from my mother and grandparents. Some members of my two major families left Latvia well before the First World War, so photographs were constantly being sent from those who stayed behind. The man could have been from either of my two families who lived in quite separate places in the old country. Although over the years I had different volunteers translating letters and postcards in Latvian and Russian, I had overlooked this one. All it had on the back was a faded, stamped inscription in Cyrillic script. Serendipity glowed to life when Greta picked up on one of my blog posts and offered Russian translation. The scan was sent. YES! It was merely the photographer's stamp, BUT his address was Sissegal. The town named Sissegal (German) is Madliena (Latvian). You have to know something of the contemporary political powers in play to appreciate the Latvian-German-Russian place name variations. That was the crucial identifier. My Freibergs lived close to Madliena, a town of some authority in the district. My Jurikas family lived nowhere near there and would have had no occasion to visit the town, especially for a photography sitting. Otto did. Elected by his fellow parishioners, he had become a prominent reform leader in the district. In fact, it was to Madliena that district police force-marched him, under orders from the embattled Vatrāne (German: Wattram) estate owners, to face a firing squad on 4 February 1906. Thank you, Greta! Geneabloggers are the best! Thank you also to Callie who also offered language assistance (what will I find next in the archaeological-genealogical midden?!). Alice's urban garden; photo BDM May 2011. Already mentioned — the serious gaps in Highland parish registers make this an exercise based on incomplete information. It’s true that a few churches went without a local minister at times, but also “... it is to be regretted that the entries were not by any means regularly made, and this circumstance is probably owing to a strong prejudice which obtained against it in the minds of the people, as from any remissness or neglect on the part of the clerk.” Yes ... the Highlander’s aversion to “outside” authority. Back to the drawing board in the search for potential parents of John Fraser of Inverness-shire, Scotland, and Argenteuil, Quebec. After viewing the ScotlandsPeople images, Alexander featured more frequently as a father’s name; the name James Fraser was less common and cast up but one father prospect. I’ve added some comments about the entries. Extra detail in the records varies from one minister to another. ❶ Alexander Fraser in Ballehagan whose son John was baptized 24 November 1776 in Kiltarlity parish, mother not named. This one entry meets the estimated birth year of 1776. No witnesses were noted. Examination of the Kiltarlity OPR on ScotlandsPeople showed that the Kiltarlity church minister habitually, annoyingly, ignored the names of mothers. But he did usually record where the father resided, a farm called Ballehagan in this instance. The entry specifically mentions that the Rev. Mr. Alexander Fraser at Kirkhill performed the baptism. Kiltarlity and Kirkhill were adjoining parishes and each had more than one church. ❷ Alexander Fraser and Isabel Fraser, parents of John baptized 7 September 1777, parish of “Boleskine/Abertarff or Ft Augustus.” Alexander was described as “Head[?] of Tenant in Glendoebeg”; baptism was performed by Mr Peter Grant. No witnesses. Another case of several churches widely scattered within one parish. And this triple-barrelled place name was familiar from a John Fraser-Ann Fraser couple having children baptized there 1794-1797. Isabel is a name not repeated in my family. ❸ Alexander Fraser in Wester Kirkhill and Margrat Fraser were parents of John baptized 25 May 1778, Kirkhill parish. Witnesses Alexander Nichol and James Huston[?]. 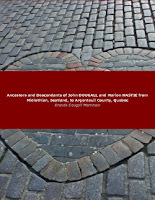 Likewise, Margaret is not a name among my John’s children or descendants. ❹ Alexander Fraser in Culloden and Mary Fraser were parents of John baptized 3 August 1778 by Mr. Robert Rose, Inverness parish. Witnesses Thomas Fraser and [blank] Smith in Culloden. Alexander was not called a labourer, which the minister was careful to point out for many others. Mr. George Watson seemed to be most prevalent minister mentioned in the register, so Mr. Robert Rose may hold a clue. Our John named his 4th daughter Mary. ❺ James Fraser, father of John baptized 11 November 1772, Kiltarlity; mother not named. Father’s residence was in Brearachy/Buarachy. Witnesses were William McPherson in Teatore[? ], Hugh Fraser in Foxhall. It was customary for the Presbyterian clergy to be addressed as Mr. So-and-so; the man performing the baptism seems to be named if he was not the usual incumbent. Ministers’ names may also be clues to a particular church location. Unfamiliar place names (likely local farms or hamlets) would need exploring IF any of this will gel. Do any of these “parent” parishes correspond to the (negative) marriage search for ancestor John and his first wife Ann Fraser ... assuming he married in the place of his birth? Hardly. The best I can say is that the parishes of Kirkhill, Kiltarlity, Boleskine, and Inverness are common. Each presented its own assumptions and problems in attempts to find correlations. On such slim pickings do hypotheses flutter. I need to shake this loose till all the available pieces fall out. Next: the FAN club. Some of you know what I mean. (https://wiki.familysearch.org/en/Kiltarlity,_Inverness,_Scotland_Church_Records : accessed 23 April 2011), citing New Statistical Account of Scotland (1841). ... continuing a small series of less-than-exhaustive searches for two mysterious George Porters. It’s been a while. Poor George Porter and his doppelgangers must be silently resentful at my neglect. What I’ve been doing overall—I think—is examining not only what might have happened to George Porter of Niagara and York (The Carpenter), why and how he disappeared, but also where he came from. A subsidiary interest developed when another George Porter (The Prisoner) appeared. Further characters were introduced here and here. I’m down to the outer ring of a bull’s eye chart around both the George Porter who was one of the first residents of York, and the George Porter imprisoned in 1814 in Upper Canada’s London District. Do we have potential fathers, brothers, cousins, or a few wretched coincidences? Neither George is to be confused with Pennsylvania native George B. Porter who became territorial governor of Michigan from 1831 until his death in 1834! Very little is known about medical doctor Francis Porter who practiced in Niagara. Canniff says he was from Montreal and trained in Edinburgh; Carnochan says he was a former army surgeon from Edinburgh. He died in Niagara in 1840. His brief, unrevealing obituary included the line, “The beauty of his only daughter was often spoken of.” The daughter was Maria Jane Porter who in 1850 wed George Maxwell, the customs collector at Grimsby. There is no probated estate for Francis to help out in this regard. With no age or date (except year of death) does the doctor’s timeline coincide at all with our George being in Newark by 1792? As an ex-army surgeon, Dr. Francis could have served with a regiment in the War of 1812, or perhaps even earlier in the European conflict with Napoleon. If so, did he come to Niagara with the regiment he joined, or had he retired sooner? Having a daughter born say 1825-1830 seems to indicate he was a mature man by at least the 18-teens. Not likely the father of a grown man in jail in 1814. More of a contemporary, stretching an outside chance of being brothers? In another scenario, two Francis Porters were born in Scotland between 1770 and 1800: a) son of John Porter and Isobel Davidson baptized 24 March 1794 in Angus, and b) son of Francis Porter, mother not named, baptized 21 September 1798 in Aberdeenshire. Altogether, Francis Porter still seems like an off-target long shot. His descendants will no doubt chase the Maxwells and think of searching British army records! (There’s more: wives and children). But there is no Person of Interest Part. Same names do not a connection make. Some might say instead of problem-solving, I degenerated to tilting at windmills. I might say that myself. All I’ve done is expand the possibilities of family origins and connections to a marginal extent. Even in a superficial process, some of those possibilities can be eliminated. The lazy man’s way is mere name collection. George Porter will likely make one final appearance. History of Macomb County, Michigan (Chicago, IL: M.A. Leeson & Co., 1882), 89-90. William Canniff, The Medical Profession in Upper Canada, 1783-1850 ... (Toronto, ON: W. Briggs, 1894), 558. Janet Carnochan, History of Niagara (1914, reprint Belleville, ON: Mika Publishing, 1973), 235. Loc. cit. ; citing The Niagara Chronicle “of 1840.” Thomas B. Wilson, Ontario Marriage Notices (Lambertville, NJ: Hunterdon House Publishing, 1982), 214; citing The Church (Toronto), 31 October 1850. ➠➠ Many of the above books can be viewed on Google Books or Internet Archives. “Drouin Collection,” Ancestry.ca, digital image (http://www.ancestry.ca : accessed 20 March 2011). “Scotland Births and Baptisms, 1564-1950,” FamilySearch, database (http://www.familysearch.org : accessed 20 March 2011). Lakeview Cemetery, Thorold Township (Niagara Peninsula Branch, Ontario Genealogical Society, 1985); Archives of Ontario microfilm MS 451 reel 50. It must be spring. Historic Distillery District, Toronto. Photograph BDM, 2010.